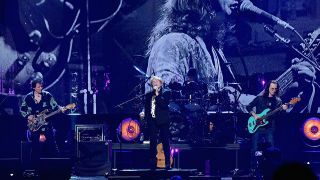 Geddy Lee has looked back at performing with Yes at the 2017 Rock And Roll Hall Of Fame and called it a “bittersweet” moment. Lee joined Jon Anderson, Rick Wakeman, Steve Howe, Alan White and Trevor Rabin onstage on the night Yes were inducted to play Roundabout at the ceremony, in place of late Yes bassist Chris Squire. Lee previously called the occasion “an honour” – and at the weekend’s Rush Fan Day at the Rock Hall during a Q&A sessions, Lee looked back at the moment. He said (via UCR): “I really did love playing that song with them. It was bittersweet for me, because Chris Squire was such a huge hero to me. The fact he wasn't there was a vacuum that no one can fill properly. Lee adds: “The guys in the band were really sweet to me. There’s sort of two versions of Yes – I guess they had a schism at some point – so that was the first time they had been together again as a band in quite a while, so it was a little awkward at a few moments. “But they all came together and they were very kind and indulged me when I kept wanting to play the song over and over again."